Everyone in an organisation should be able to use and benefit from Semlr. There are no new skills to acquire or authoring tools to learn, just write with standard office applications. The user-interface is designed to be familiar and accessible, with no menus or hidden settings, and features appearing just as they are needed. 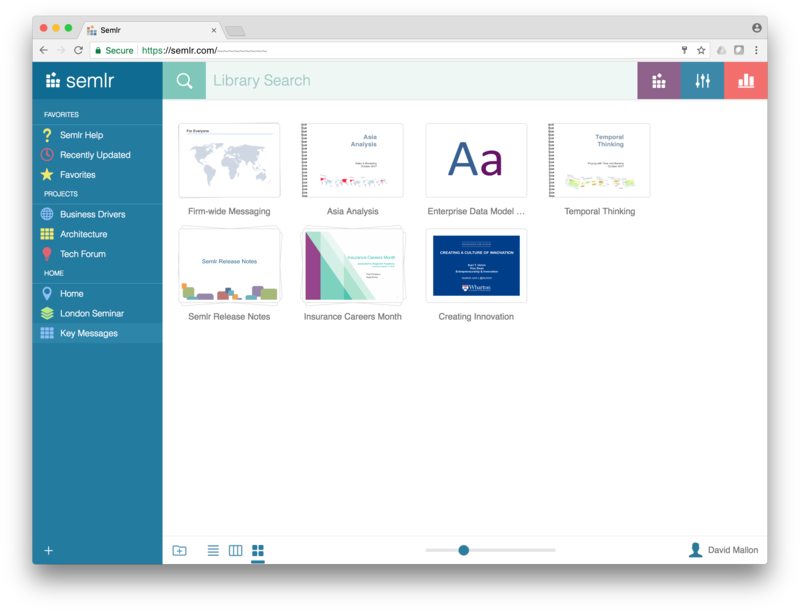 Simply drag-n-drop files, such as PowerPoint™ and PDF onto the Semlr browser and the content will start to load. As files are loaded, Semlr unpacks, indexes, permissions and prepares the content for use. This may involve character or speech recognition, and the re-assembly of dependent documents. Content is organised into Views, much like folders, but way more flexible. The same content may appear in multiple Views, and therefore be optimally structured for different teams. Semlr provides a powerful form of content previewing called skimming. 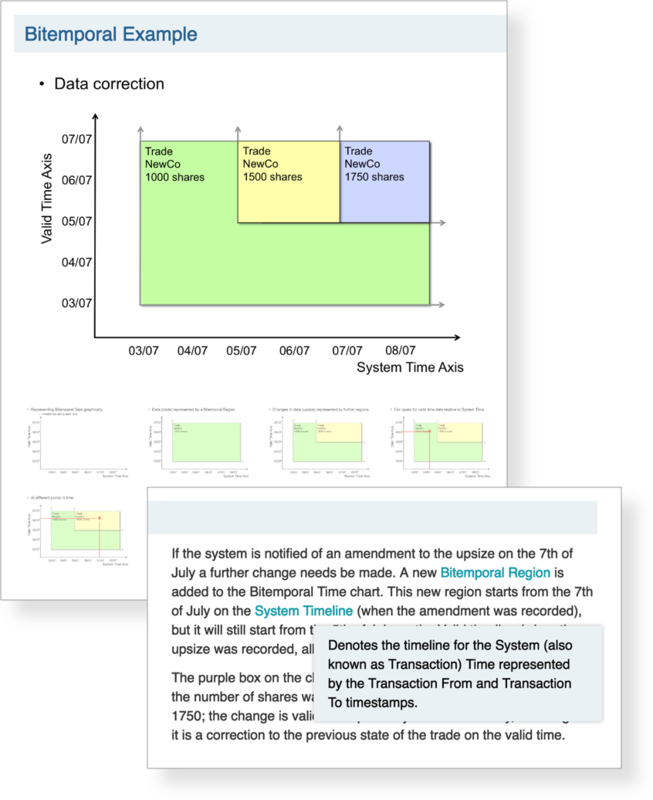 This allows a summary to be shown in a View, without requiring the content to be opened. Semlr content is presented online in beautifully rendered immersive websites, with interactive animations and roll-overs, video-clips and sound-bites. There's no need to download. Semlr enables new documents to be assembled from source content, allowing the content to be seamlessly reused without the need for cut-n-paste or the proliferation of out-of-date copies. Semlr binds source content into dynamic documents that automatically update as the source is changed. Intelligent tagging rules ensure that only the right content is passed onto dependents, making Semlr truly the semantic assembler. By separating source from output, Semlr allows subject-matter experts to be responsible for specific content, independently of the creation of any final documents. This changes the mind-set from the traditional document centric model to a content model. Workflow is improved as users need only be concerned with keeping current the content that they own, and not with the multitude of documents that may use it. Integrated throughout the UI, semantic search allows properties, text, images, sound, relationships and Views to be combined to pinpoint content. Retrace your steps with Search History, and capture common queries through Smart Views. Content may be kept private, shared with individuals and groups, shared within the entire enterprise, and/or shared securely with external clients. A delegated permission model allows users to control who can read, write and share the content further. Semlr supports deep linking to share content in context. More powerful than emailing an attachment, deep links are always current, know how to present themselves, and can't be forwarded beyond the permissions granted. Semlr optionally allows content to be exported into a variety of professional PDF, ePub and media formats for print and offline viewers. Semlr supports automatic layout and page generation, including titles, contents, indexes, glossaries and media pages. Sharing content should not imply loss of control of Intellectual Property. Semlr captures content into an online form, allowing clients to consume and assemble the content into new works, without loss of control for the content owners. When other parties reuse your content, Semlr indelibly marks the derived work with your attribution and copyright notices. This is part of the assembly process, ensuring traceability online and visibility in all exported formats. 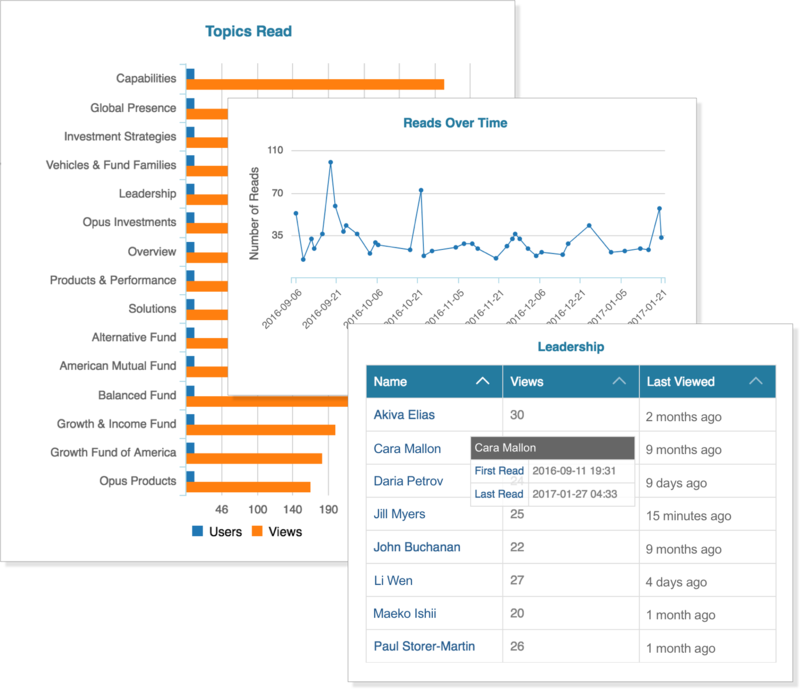 Semlr tracks how content is used, who updates and shares it, who assembles new documents from it, and when, how often and by whom it is read. Semlr tracks content at the granularity of a topic, potentially as small as a single page or media clip. 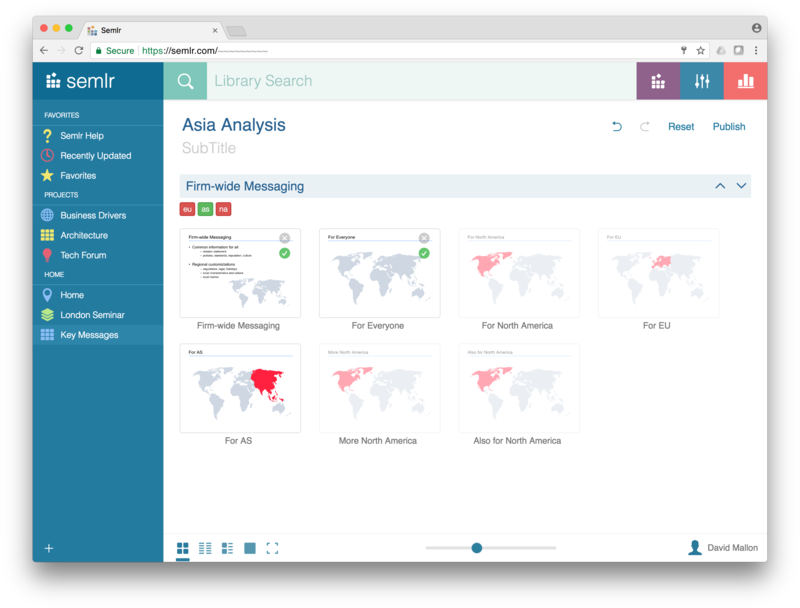 Based on tracking data, Semlr provides real-time analytics to bring business intelligence to enterprise content. It's easy to see which parts of a business communiqué have been read, or to ensure that teams are keeping up-to-date with the latest compliance and policy notices. Enterprise shared spaces (such as file systems, web-sites and wikis) are often laden with old and unused content. Analytics help to reduce this problem by making redundant topics easy to find, and inspiring authors to keep their content current. Content is a key business asset, made all the more valuable when enriched with usage analytics. Vendor management, client support, product training and business development all benefit from the knowledge of who read what and when. To be effective, security should be simple, deep and enforced by default. 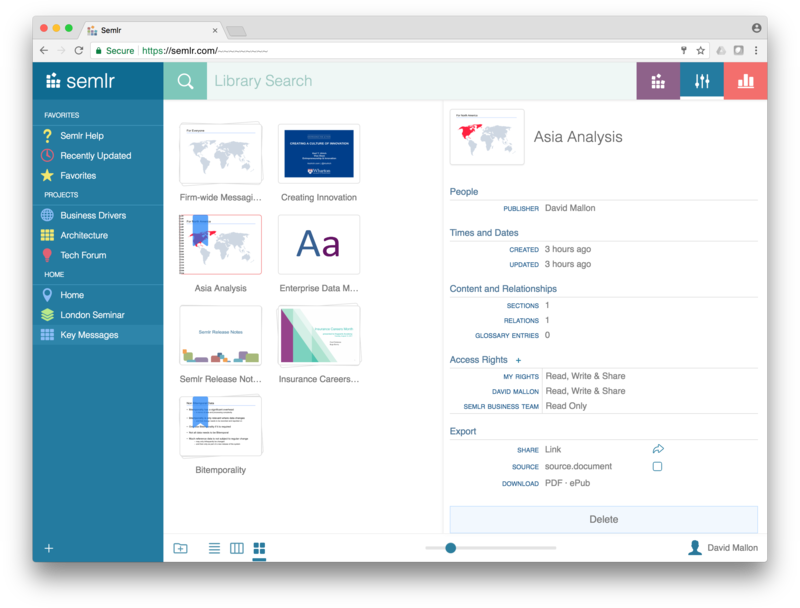 Semlr content is private when loaded, but may be explicitly shared amongst users and groups, with controls to enable reading, writing and further sharing. Semlr security architecture and policies comply with the latest recommendations for hardening infrastructure and protecting data both in-flight and at rest. Data is isolated, encrypted on disk and access controlled throughout the stack. Clients may extend their internal security perimeter to encompass Semlr, restricting access to their corporate networks, enabling single sign-on and coordinating user and group management from within firmwide systems.